Students at Etna-Dixmont Elementary School work on cleaning out the weeds and old plants from the school's vegetable garden last week. RSU 19 is in the process of overhauling how the school handles its food waste and is working to use more food grown on site in the school's cafeteria. 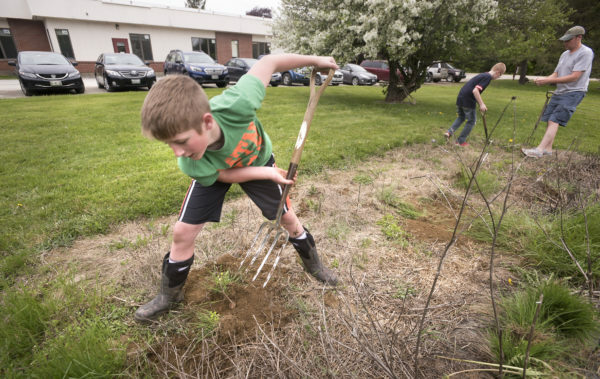 Etna-Dixmont Elementary School sixth grader Zachary Raymond, 12, works on cleaning out the weeds and old plants from the school's vegetable garden last week. RSU 19 is in the process of overhauling how the school handles its food waste and is working to use more food grown on site in the school's cafeteria. 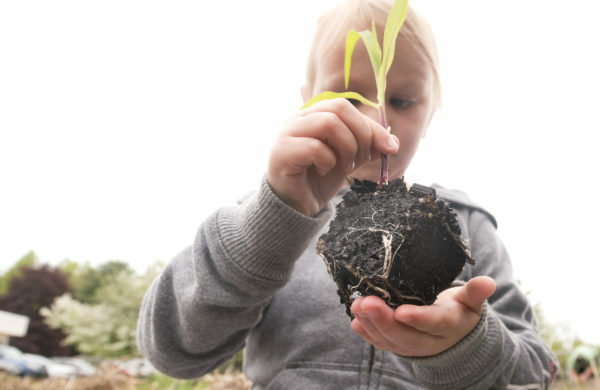 Etna-Dixmont Elementary School Pre-kindergarten student Hailey Power, 5, holds a corn seedling before planting it in the school's vegetable garden last week. RSU 19 is in the process of overhauling how the school handles its food waste and is working to use more food grown on site in the school's cafeteria. Students at the Etna-Dixmont Elementary School spread wildflower seeds in the school garden. RSU 19 is in the process of overhauling how the school handles its food waste and is working to use more food grown on site in the school's cafeteria. 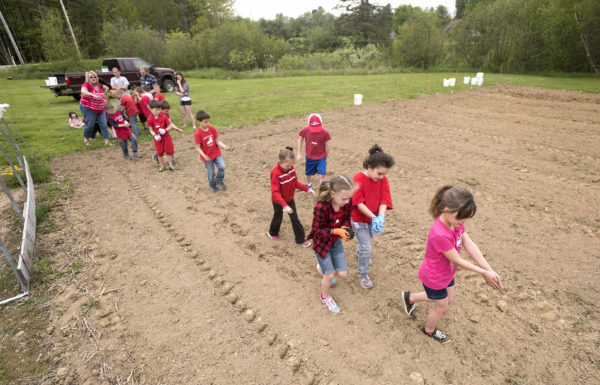 Etna-Dixmont Elementary School first graders spread cover crop seeds in the school garden. RSU 19 is in the process of overhauling how the school handles its food waste and is working to use more food grown on site in the school's cafeteria. 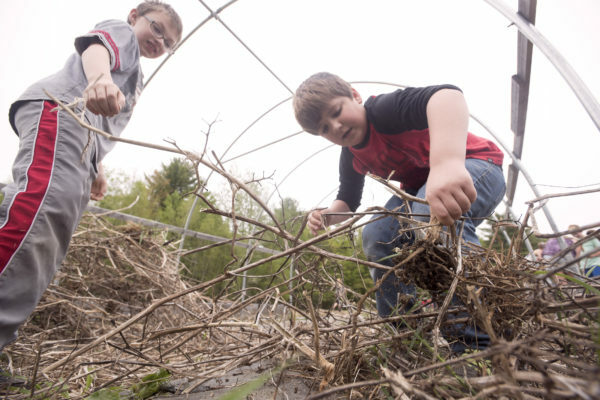 Etna-Dixmont Elementary School fifth graders Sheldon Wallace, left, and Carter Pennel, work on cleaning out the weeds and old plants from the school's vegetable garden. RSU 19 is in the process of overhauling how the school handles its food waste and is working to use more food in the school's cafeteria that is grown on site. ETNA, Maine ― Mid-afternoon on a recent Thursday the students at the Etna-Dixmont School were outside frolicking through a field on the left side of the school. While a passerby might mistake the children’s high spirits for a typical recess session, they were actually participating in a schoolwide garden clean out day. With rakes and rubber boots, the students ripped out remnants of last year’s garden to make way for this year’s planting. The quarter-acre garden at the Etna-Dixmont School is entering its third season of production, but thanks to a massive overhaul of how Regional School Unit 19 handles its food waste, school administrators are hoping the scene at the grade school will soon be the case districtwide. After taking the last year to measure how much food waste is generated on average in each of the district’s school cafeterias, RSU 19 has secured funding to build composting bins and hoop houses at several of the schools in an attempt to put the food waste the district generates to good use. 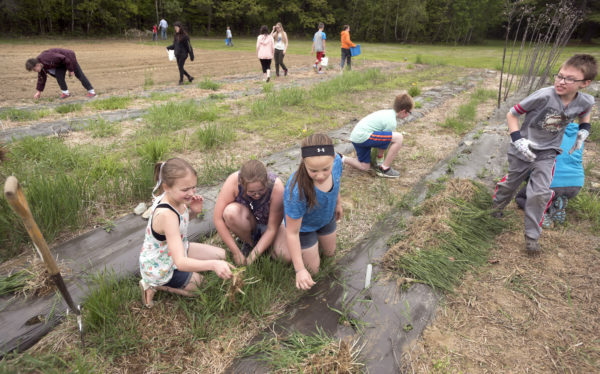 At the beginning of the 2016-2017 academic school year, the district teamed up with Ryan Parker of the Natural Resource Council of Maine to study how the eight-town school district could better manage the food waste it generates. By setting up a three bin sorting system that separated the waste generated during lunch into trash, recyclable materials and food scraps, the district was able to measure how much of the solid waste it was paying to have hauled to a landfill was actually compostable food waste. What they found was that the district was generating about 75,000 pounds of food waste annually. While Parker says he often hears arguments that separating food waste in schools won’t work because students will never do it, the students at RSU 19 effectively proved those critics wrong. With the data collection portion of the district’s food waste project complete, students and faculty are gearing up to put the food waste they generate to use. Earlier this month an orchard was planted at the middle school using part of the grant funding that Parker helped the district secure for its food waste overhaul. The fruit trees will produce apples and pears that will be used for healthy snacks in the schools. In the coming weeks, composting bins and hoop houses will be constructed at several of the schools so that when the students return in the fall the food waste can be put to use immediately. Since it costs the district to dispose of trash, removing any amount of food waste from the waste stream has financial benefits. But for Hammer, the cost benefits of composting the district’s food waste was only a small part of why he wanted to revamp how the schools handle food scraps. From learning about the environmental benefits of composting to being involved in the growing of their own food, Parker said the educational opportunities in this kind of set-up will be endless and the students will be more likely to eat healthier food. 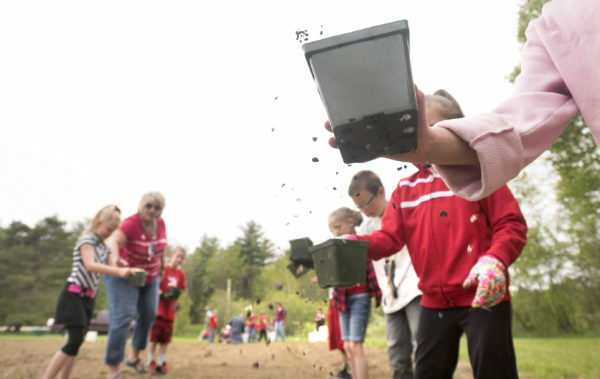 The excitement over being able to get their hands in the dirt was evident at the Etna-Dixmont school. While a fair share of the students were simply happy to be out of the classroom for the afternoon, the importance of growing healthy food right outside their classroom window did resonate. Eighth grader Ashton Knight said his favorite part about having the school garden was being able to eat what he and his classmates were growing. His favorite school-grown snack? Peas. “The garden pretty much provides all of the snacks for the school,” Knight said. The three-bin sorting system that was in place this year will now be the standard going forward, and the high school’s garden club will be tasked with collecting the scraps for compost. While only a handful of students have expressed interest in overseeing the composting and planting operations, Parker said once the system is in place he expects interest to grow. A reason that Hammer wanted to go all in and implement the new food waste handling system districtwide was so that from the time a student began school to the time they graduated, the ethos of better handling food waste will be the norm.